Personal guarantees are common for certain business transactions. For example, business loans acquired through the Small Business Administration (“SBA”) routinely ask for personal guarantees from the owners of the business. Commercial landlords can ask for personal guarantees from new businesses or where there are significant tenant improvements as part of the lease. Individuals are often asked to guarantee business debts for friends and family who may be starting a business or acquiring student loans. These personal guarantees can have unanticipated consequences down the road when the primary borrower defaults and the lender starts looking to the guarantor for payment. The good news is that personal guarantees are usually able to be discharged in bankruptcy if the original obligor/borrower is in default. Most people assume that setting up a limited liability company (“LLC”) or a corporation shields them from personal liability for business debts. The reality, however, is that many third parties are savvy enough to realize that it can be difficult to collect on business debts when a business falls into distress. For this reason, lenders, trade creditors, landlords and others often require business owners to personally guarantee business debts. This makes the personal guarantor liable if the business is unable to pay its debts. First, guarantees should be distinguished from co-signing on a loan. Co-signing on a loan makes a person liable for the payment regardless of whether the other signor stays current. Debts incurred by co-signing usually appear on a person’s credit whereas liability as a personal guarantor rarely does. But this is something to ask and consider in advance of signing the personal guarantee. Likewise, personal guarantees in Arizona must be signed by both spouses in order to collect against community assets. A.R.S. § 25-214(C)(2). If not signed by both spouses, the guarantee can have little weight in attempting to collect against a married guarantor and is relatively unenforceable or worthless. Second, if you are being asked to sign a personal guarantee, you can, and should, try to negotiate limits on the extent of the guarantee. For example, commercial landlords will often be open to a personal guarantee for a portion of the lease such as the value of the tenant improvements. Unless a business is a sole proprietorship, personal guarantees can only be discharged by filing an individual bankruptcy. A business bankruptcy will not eliminate a personal guarantee. Likewise, the Chapter 13 co-debtor stay only applies to consumer debts and personal guarantees are usually considered business debts. Therefore, a business or related bankruptcy will not eliminate the personal guarantee nor will it even temporarily stop collection efforts against the guarantor. A personal guarantor must generally file their own bankruptcy to eliminate the debt on the guarantee. There is one possible exception to this general rule and a way to seek to eliminate a personal guarantee with a business bankruptcy. If the entity files a Chapter 11 proceeding, the Chapter 11 plan can include an exculpation clause that releases the individual guarantor. If creditors are not diligent to read the fine print and object, the personal guarantors can be released through a confirmed plan. Likewise, Chapter 11 for a business allows the debtor to extend the automatic stay to co-debtors unlike other chapters of the bankruptcy code. This is usually done under Section 105 on the theory that preserving the guarantor’s credit can assist with the reorganization process. Personal guarantees can generally be discharged in all circumstances unless the underlying debt is non-dischargeable such as taxes or student loans. However, liens giving a security interest in property as part of the guarantee cannot be avoided in most instances. A good practice tip for any individual filing bankruptcy with a personal guarantee is to name any co-guarantors on the bankruptcy petition to avoid post-petition indemnity claims. If you have a personal guarantee that you cannot satisfy, you should consult a bankruptcy attorney to consider your options. Likewise, in many circumstances, individuals can file for personal bankruptcy protection and still keep their businesses active. This eliminates any personal obligation on the guarantee and the lender can only pursue the business for the funds. Personal guarantees are not as tricky as they sound, especially if you consult with an expert. 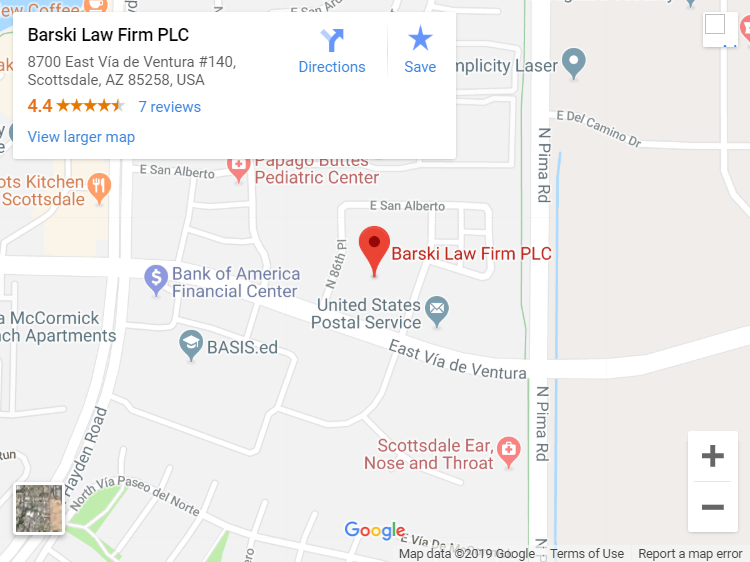 Barski Law Firm, PLC has decades of experience in delivering realistic bankruptcy solutions for both individuals and companies. Contact us, today, and we’ll help you get started on a comprehensive and efficient bankruptcy strategy.